Chicago Playworks, Photo Credit: John BridgesWhat will happen to Cinderella at the ball…game? That’s the surprising climactic question in this contemporary Latin-American Cinderella Musical, which delightfully turns the classic fairy tale on its head, telling the story from both Cinderella and the “step-sister’s” perspective. Cinderella Eats Rice & Beans was commissioned and premiered by Imagination Stage in 2003 under the direction of Kate Breyer. It is a featured play in the book “Palabras del Cielo: An Exploration of Latino/a Theatre forYoung Audiences“. 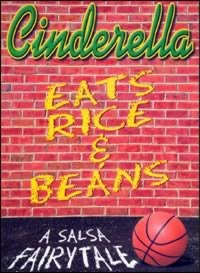 Cinderella Eats Rice & Beans is published by the Dramatic Publishing Company. CINDERELLA (CENICIENTA) – A 6th grader from Puerto Rico visiting the United States to learn English. ROSA – The wicked-cool “step” sister. Loves pop music, basketball and being popular. JOEY – Rosa’s best friend & head of the pep squad. Also plays NARRATOR. Music: Salsa, Cumbia, Hip-hop, Rap. Accompaniment tracks available.